Having discussions about craftiness the other night was spurring my brain into design territory. I went supply shopping yesterday for a new idea I have, but I promised myself I needed to finish up my niece's outfit, that I started back in May, before I took this on. That turned into, well, you better start the project you promised a friend a while ago too. And that was quick, so I finished it. Then I figured, hey, I'm on a roll, I might as well finish the one FO I have sitting around that merely needs one seam sewn. (Oh, and as I write this, I realize I finished another project just a few days ago, which just needed ends woven in, so there'll be a sixth on this post. The third piece of this needed the most to finish: ends woven in, collar picked up and knitted, pockets and tabs sewn on. But here it is, Anouk, as styled with the other pieces. So while all that was blocking, I knitted up a quick earwarmer headband that Donna de la Muerte had asked me to do for her a while back. Donna crochets, but doesn't knit, so this was a services trade. :) However, Donna also finds me the most kickass buttons and such related to knitting at craft shows, so I think I'm still in the hole after this. (She's also probably doing a knitting tattoo on me in the very near future, so stay tuned for that. And then, lo and behold, I actually decided to sew up a tank top that I started way back in 2004. Seriously, this was probably my first major purchase at a real yarn store, and I believe most of it was actually knitted on aluminum needles, something my hands couldn't take now. This might be the world's heaviest tank top (it's double-stranded Lana Grossa Rotonda), but I think it's still pretty wearable. And, for FO #6, we see the cash iroha gloves I started knitting last winter, and then picked up on a whim the other night, just to realize that only one glove needed ends woven in. That was simple enough while sitting around with friends, so now I also have fuzzy soft blue gloves. Nadja's hands are much smaller than mine, but she graciously modeled. Now I really want to go work on one of the two sweaters which are languishing half done in the other room. But maybe that's enough for one day. Maybe not. I'm finally getting around to clearing out some leftovers and unwanted yarns from my stash. If you're on ravelry, it'll be easiest to take a look at them here, on my stash page and then PM me, but if you aren't on there yet, I'll post this list here as well. I'll entertain the idea of trades, and prices are somewhat negotiable, but I do prefer sale via paypal and shipping within US only. If you're interested, feel free to email me at wittyknits AT gmail DOT com. Diakeito Disantafe 524 $12 plus shipping All the yarn is there, but a few yards were used for swatching and have been cut, so that yardage is in a small ball are inside the ball. ONline Linie 81 Gina 11 sage "Has come loose and been rewound, but it's all there. Plymouth Yarn Encore DK brown "This is only missing a few yards, if that. (Enough to embroider a nose on a Bobbi Bear. )$3 plus shipping"
Plymouth Yarn Encore DK green heather "I think this is almost complete. $2 plus shipping"
Rowan Cork 046 "One complete ball plus a tiny bonus of a couple yards.$9 plus shipping"
All the pieces are knitted. Just need to sew up. So all that's left to create the worlds cutest baby outfit is sewing this up, making the hat, and sewing the buttons on the booties (which I am crossing my fingers she hasn't grown out of, otherwise, I'm making a second set. So of course, what do I do? I cast on the world's ugliest socks. Cascade Fixation, with a tiny bit of modification off of a freebie footie sock pattern I foundon ravelry. By far the worst pooling of anything I've ever made, but they'll be fine inside shoes. Finally finished this one. A very quick knit, but I am not one for finishing things up lately, especially if it involves the sewing on of buttons, as evidenced by several projects indicated at 95% finished in my ravelry notebook. In any case, I'm going to mail this off to Chloe soon, even if it'll be a little while before she fits into it. I've started on the cutest outfit ever, for my niece Maya. I've wanted to make Anouk from Knitty (by Kate Gilbert) for several years, but haven't known any little girls of the appropriate age. Now it seems there's a baby boom among my friends and family, and wouldn't you know, quite a few little girls. I stashed some Pakucho Cotton a few years ago for a dress for myself that never materialized, but I got this crazy color scheme in my head for this and I'm using this for Maya's Outfit instead. One of my teammates alerted me to this book last night at practice. Yes, that's Kelley Deal as in The Breeders. Wow. One of the profs where I work has been cheerfully prodding me to write a knitting book that combines knitting with one of my other interests. We came up with "geek knitting" (but I think it's been done) and of course, knitting and roller derby. My argument has been that derby takes up enough time that the book would never get done. 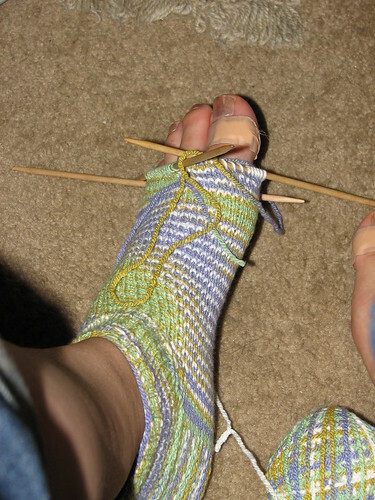 So I am happy to see that someone else has a better life/work/derby/knitting balance than me. Joan of Dark of Naptown has this book coming out soon. That's seriously awesome. My ultra-luxurious Noro Cash Iroha gloves. These are super soft and awesome. I have actually have all but the thumb done on this one right now, and hope to have the pair done by the end of the week. The finished product as modeled by the recipient. I really wish I'd made this a bit narrower and therefore longer, but the random striping worked out pretty nicely. I just finished one of Nadja's Christmas presents this weekend -- this is a randomly striped garter stitch scarf out of Terra by The Fibre Company. We picked this up in NYC at Purl while there over Thanksgiving. It's super warm and soft -- a Silk/Alpaca/Merino blend. Yummy. I blocked this one quickly (as evidenced by the photo) but I think it will loosen up even more once she's worn it for a bit. I'd make it a bit narrower if I had it to do over, but I'm still pretty happy with it. I wove the ends in as I went on one side, and then pulled the rest through with a crochet hook when done, and so far, it's all holding. Started a pair of gloves for myself two nights ago. I have especially large hands, mostly beause of my super long fingers, so finding gloves in stores to fit me is a little difficult. I've ripped up two pairs of gloves this winter, just from pushing my fingers through the ends. So I'm happy to have a custom pair of gloves. I've never made gloves before, oddly enough, and these are going super fast (using DK weight yarn) so I might be hooked. I have an idea for some fancier gloves out of sockweight yarn, so those might be up next finally!